It is estimated that over 80% of the global population is exposed to unacceptably high levels of air pollution, which can have damaging health effects. In fact, according to the most recent analysis of the global burden of diseases (2015), particulate matter (PM) air pollution exposure alone is the 5th leading risk factor for mortality worldwide, accounting for approximately 4.2 million deaths (7.6% of global deaths). Common diseases associated with both acute and chronic PM exposure include asthma, chronic obstructive pulmonary disease (COPD), respiratory infections, cardiovascular, metabolic, gastrointestinal, skin and central nervous system (CNS) diseases. While the specific mechanisms leading to the development and progression of each of these diseases vary, all have a common underlying pathology of inflammation and oxidative stress. Various nutritional interventions have been assessed for their protective effect against air pollution exposure. Dietary supplementation with vitamin E is hypothesised to be beneficial due to its antioxidant and anti-inflammatory properties. Here we review the literature on the adverse health effects of air pollution on the respiratory, cardiovascular, metabolic, gastrointestinal, skin and central nervous systems and the role of vitamin E in modifying the detrimental consequences of air pollution. 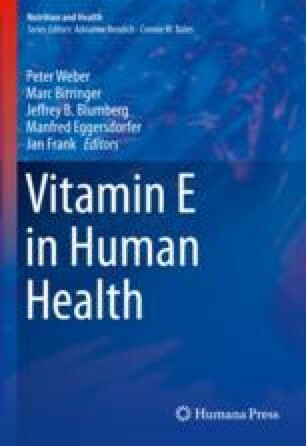 While there is evidence from clinical trials regarding the benefits of combined vitamin E and C in ameliorating the effects of air pollution in asthma and reducing the risk of respiratory infections, further work is needed to assess the efficacy of vitamin E supplementation in protecting against the numerous other health consequences of air pollution exposure. World Health Organisation. Top 10 causes of death fact sheet 2017 updated January 2017. Available from: http://www.who.int/mediacentre/factsheets/fs310/en/. World Health Organisation. Cardiovascular diseases (CVDs): WHO; 2017. Available from: http://www.who.int/mediacentre/factsheets/fs317/en/.